Happy Wednesday! Today is the day the the AHSC design team members share their interpretations of Michelle's sketches. The Atlantic Hearts Sketch Challenge is set up in such a fun way: a new sketch is posted each Monday, and design team inspiration is show on Wednesday. That way, participants can choose to play either before or after being influenced by the DT's interpretations of the sketch. Such fun! Hope you will visit the AHSC Blog and play along! 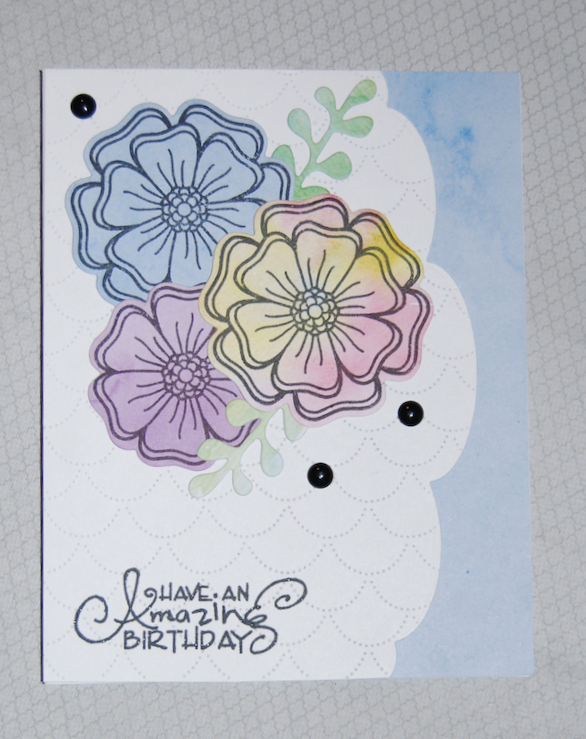 I love the scalloped edge included in the sketch, and the cluster fo flowers creates such a sweet "paper planting" of blooms! ETA: Thanks for the heads-up about the Double Trouble challenge. 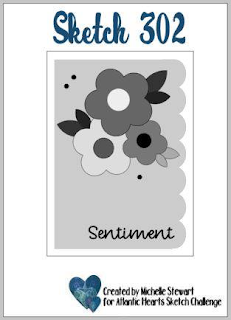 My card includes both flowers and the AHSC. Love that wide scalloped edge and the scalloped background, and like the soft colors you have used for your florals...beautifully done. Hope you will join us over at Double Trouble this week with your pretty floral card to be eligible for our random draw prize, and hope that you will join us again for future fun challenges. Thank you for partnering with us the next couple weeks. Very soft and pretty. Thanks for linking up with us at Double Trouble...I always love Michelle's sketches and it was fun to partner with you.